Doctor sat next to patient at the post-Standard Chartered Singapore Marathon (SCSM) press conference yesterday. But the physician was not there to offer medical support. Rather, Lim Baoying was receiving acclaim for being the top local woman finisher at the SCSM. 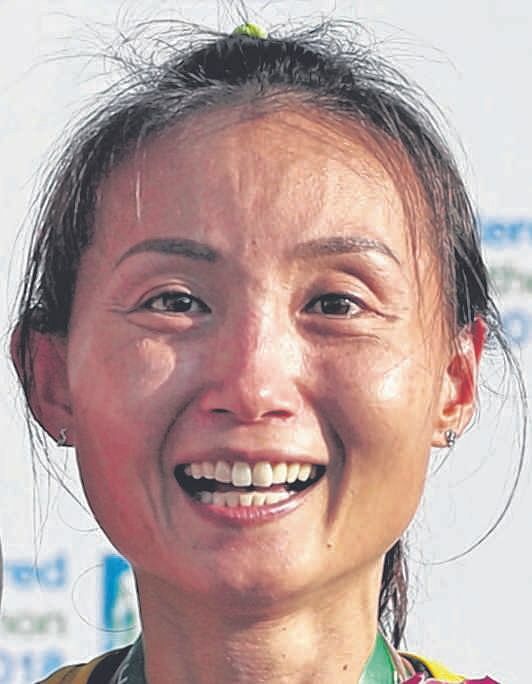 The 36-year-old was a surprise winner, clocking 3hr 16min 36sec, ahead of last year's top local woman Rachel See (3:18:36) and Hu Xiuying (3:18:57). Lim had run the SCSM almost every year since 2006, and her previous best finish was fifth last year. The resident physician at the Changi Sports Medicine Centre treated Soh Rui Yong, the top Singaporean male runner yesterday, for a foot injury following the Berlin Marathon in September. "I was struggling with posterior tibial tendinosis in my left foot. It was very sore," explained Soh. "So when I came back to Singapore, I went to see Baoying, and she gave me this very painful treatment called a PRP (platelet-rich plasma) injection. I was struggling with posterior tibial tendinosis in my left foot. It was very sore. So when I came back to Singapore, I went to see Baoying, and she gave me this very painful treatment called a PRP (platelet-rich plasma) injection. SOH RUI YONG, the top local man for the second year running at the Singapore Marathon, on how he recovered from an injury he had been carrying since the Berlin race. I'm currently doing a Masters programme as well, so I have really under-trained this year. I've been sleeping past midnight almost every night. So to win is amazing. LIM BAOYING, on her unlikely win in the local women's race. "Now I'm much better. I was able to cool down after my race. Usually I'm limping around, so it was very effective, and I'm very glad I get to share the stage with Baoying. "It's as though it has come full circle." Lim was giddy with excitement at her unexpected achievement, breaking out in fits of giggles while answering questions. Aside from juggling training with work and studies, she also had to contend with a sprained left ankle that made her unlikely victory even more impressive. She injured it on Saturday after stepping on an uneven grass patch. "I'm currently doing a Masters programme as well, so I have really under-trained this year," she explained. "I've been sleeping past midnight almost every night. So to win is amazing." Two-time SEA Games marathon champion Soh, 27, retained the title he won on his debut last year by clocking 2:41:49. While the time was far from his best of 2:24:55, he was pleased that the "hard, fast long run", a tune-up event for his bid to break the national mark of 2:24:22 at the Tokyo Marathon in March, went well. "This race definitely gives me confidence... that I can adapt accordingly to different plans," he said. "And 12 weeks, barring injury, should be pretty good preparation to go from what I'm doing now to get to the shape I need to be in to run fast in Tokyo." Ahead of the event, the contest to be the top local man, which doubled up as the national championship, had been cast as a spiced-up rivalry between Soh and fellow national marathoner Ashley Liew. Liew had finished second last year behind Soh. The pair went head-to-head yesterday against the backdrop of Soh's comments two months ago, alleging that Liew's act of sportsmanship at the 2015 SEA Games - which earned the chiropractor widespread praise as well as a prestigious international accolade - did not take place. But Liew finished in 3:09:59, not among the top 10 local men and way off last year's time of 2:50:29. Instead, the silver went to Mohamed Iskandar (2:49:46) and the bronze to Giebert Foo Xiao Wen (2:54:14).